Acer offering up yet another 13.3-inch laptop, in addition to its newly unveiled Chromebook. The Swift 7 is a ridiculously thin Windows 10 laptop, clocking in at a hair under a centimeter – 9.98mm or 0.39-inches to be exact. That sort of svelte profile certainly puts the company in running for the thinnest notebook around. The Swift 7’s all-aluminium design with grey and gold coating is eye-catching along with a Gorilla Glass covered display flanked by thin bezels. Acer’s promising a full 9 hours of battery life on a charge, which is quite impressive, given the notebook’s narrow footprint. Inside, that is one of the very first laptops to be offered with Intel’s new seventh-generation Core i-series processors (sometimes known by the name Kaby Lake), which Intel says will provide extra power for video decoding and playback, while operating more efficiently for the better battery life. Screen size clocks in at 13.3 inches at Full HD (1920 x 1080) resolution with an IPS panel. It houses 8 gigabyte of RAM and a 256 gigabyte solid state drive. Along the laptop’s right edge there are 3 connectors: two USB Type-C 3.1 ports (one for charging and one for data) and a 3.5mm audio jack. It is nice to see more than one USB Type-C connector, although it’s one fewer than the HP Spectre 13. The Acer Swift 7 laptop will go on sale in September in China for 6,999 Yuan. 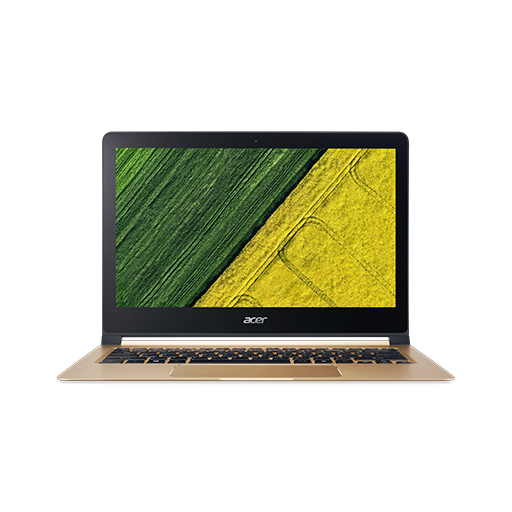 Following China, US and Europe will be receiving the Acer Swift 7 in October for $999 and 1299 Euros respectively.